Phone calls are a part of everyday business life and since time means money, then communications should be as efficient as possible. 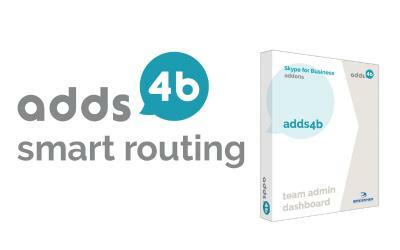 To maximize call handling flexibility, BRESSNER has developed their adds4b™ - basic add-on, which delivers convenient telephony features to Microsoft® Skype® for Business Online and On-Prem. The new software replaces the Skype for Business Call Monitor and is also compatible with Microsoft Office 365. The new adds4b™ - basic telephony client from BRESSNER offers many features that are already familiar to users from the traditional telecommunications sector, including call forwarding with or without consultation, second call handling, integrated contact search (Top 10 list), redial list from last 7 calls, Busylight – Support and function keys for a quick call handling. "Despite the many features and functions, adds4b™ - basic is easy and intuitive to use," says Josef Bressner, Managing Director of Bressner Technology GmbH. This also greatly increases user acceptance of your Skype deployments and just makes life easier. 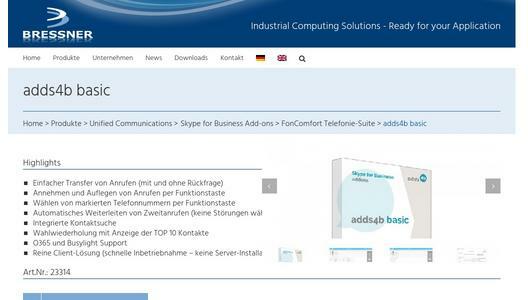 adds4b™ - basic is a pure client solution. Since no server installation is necessary, the commissioning can be done quickly. A free 60-day demo version is available online as well as on request. 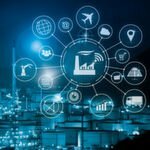 BRESSNER Technology GmbH is a system house and value-added distributor for industrial IT solutions and products for measurement and automation, automotive, transportation, logistics, medical, M2M and IoT applications. 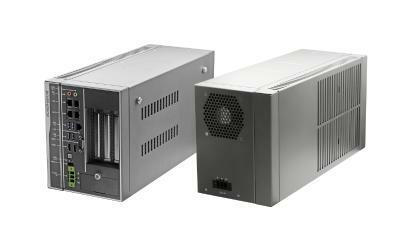 The product range covers the following core areas: "Telecom and Skype for Business Solutions", "Industrial and Embedded Computing", "Panel PC and Display Solutions" and "Communication Solutions". With its own software development for Skype for Business / Lync, BRESSNER Technology has established itself as a Microsoft GOLD Partner. BRESSNER Technology is also ISO 9001 certified. Founded in 1994 by Josef BRESSNER, the company currently has over 40 employees and offices in the UK, USA and the Czech Republic.